provides retail or lease customers with one very significant benefit - peace of mind. This peace of mind comes from knowing that you and your family are protected from the burden of an unexpected financial obligation if your vehicle is declared a total loss. You might assume that your physical damage auto insurance is sufficient to cover any losses related to your vehicle. However, when a vehicle is declared a total loss, the primary auto insurance settlement is generally based on the market value of the vehicle, which may be substantially less than the balance still owed on your finance or lease contract for the vehicle.3 This difference is called the deficiency balance, which the vehicle owner is generally responsible for. 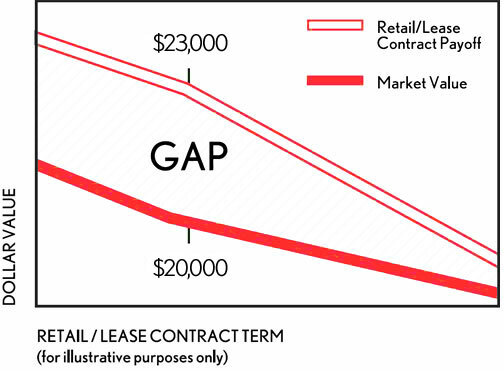 Here's how GAP works: In the event of a total vehicle loss, GAP covers you once insurance has paid its share, paying the difference (or deficiency) between your Toyota's insurance payment (usually market value) and the balance on your finance or lease contract. GAP will also pay up to $1,000 of your auto insurance deductible (if applicable) in most states. Take a look at the chart here for an idea of GAP coverage in action. 1. Less any delinquent payments, taxes, and past due charges. See agreement, certificate, or waiver for complete details. Some restrictions apply. 2. Available in most states if it is purchased and disclosed separately on the finance/lease contract. See agreement, certificate, or waiver for complete details. 3. See your auto insurance policy for actual coverage in the event of a total loss. 4. Not all customers will qualify.